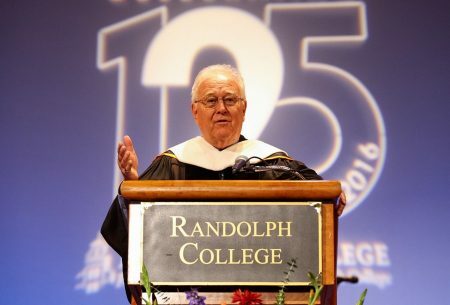 President Bradley W. Bateman speaks during Randolph’s 125th Anniversary Convocation. Alumnae and alumni, current students, and leaders from throughout Randolph’s and R-MWC’s history gathered in Smith Hall Theatre Saturday for a culminating celebration of the College’s 125th anniversary. A procession of delegates from each decade of graduating classes as well as current faculty members filed into the theatre, and Gordon Steffey, the Barbara Boyle Lemon ’57 and William J. Lemon Associate Professor of Religion and Philosophy and Division Head for Arts and Letters, opened the ceremony with an invocation. Special music was provided by the Randolph College Chorale and the 125th anniversary brass and percussion ensembles. The groups performed musical selections inspired by William Waugh Smith, the College’s founder and first president, as well as notable alumnae. Lyrics for one piece, From the Good Earth, were inspired by the famous poem by Pearl S. Buck, a member of the Class of 1914 and winner of the Pulitzer Prize and Nobel Prize for Literature. President Bradley W. Bateman saluted the founders of the College. During his remarks, Bateman focused on four individuals who played key roles and exhibited outstanding bravery and leadership in different time periods in the College’s history. The first was Smith, who was responsible for not only securing funding to open the College, but also stepping up as a leader when he agreed to serve as its first president as well as the chancellor of the entire Randolph-Macon system of colleges and schools. The second was Louise Jordan Smith, William Waugh’s cousin and the College’s first art professor. She established studio art courses and the Annual Exhibition of Art, which continues today. William F. Quillian, Jr. was the College’s longest serving president, and welcomed R-MWC’s first black students, despite backlash from the community as well as others in the College’s administration. Most recently, Jolley Bruce Christman ’69, a trustee emerita, served as president of the Board of Trustees when the College made the difficult decision to adopt coeducation and change its name. David W. Breneman, president of the Society of the Four Arts in Palm Beach, Florida, and professor, emeritus, in economics of education and public policy at the University of Virginia, delivered the keynote, “The Liberal Arts.” He spoke about the origins of liberal arts education in ancient Greece and Rome and how this style of education has progressed through the years. 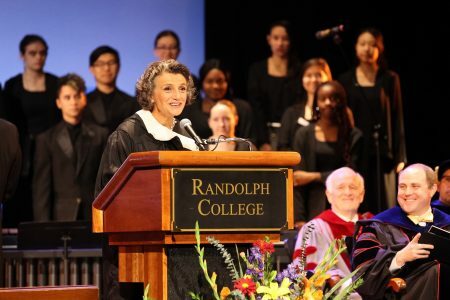 Breneman was impressed by Randolph’s positive trajectory and excellent leadership in what is a challenging time for small, liberal arts colleges. Others from the community shared in the celebration with special wishes to the College. The Reverend John B. Peters, executive director of the Association of Educational Institutions for the Virginia Conference of the United Methodist church, spoke about the College’s longstanding connection to the church and Randolph’s strong emphasis on community service. Lynchburg City Mayor Joan Foster also credited Randolph and its students for contributions to the area over the years. In addition to the Convocation ceremony, the College invited alumnae, alumni, and members of the College community to a production of the Greek Play, The Frogs, a Homecoming tailgate during the women’s and men’s soccer games, and a Birthday Party featuring delectable desserts, dancing, and a video DJ. 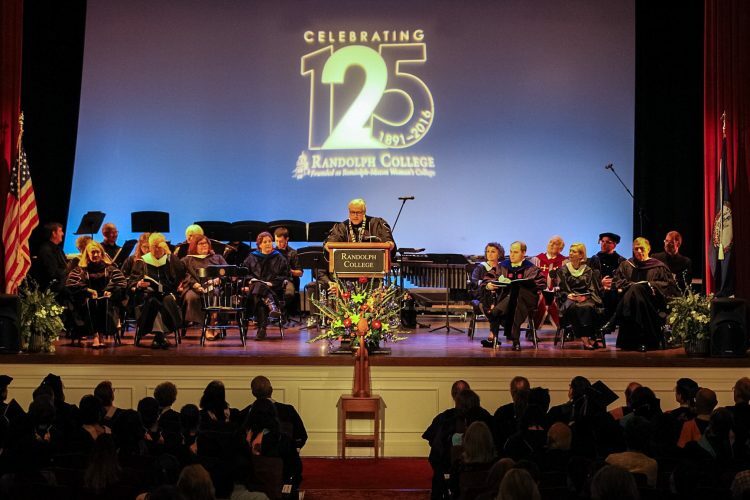 For more information about Randolph College’s history and its 125th anniversary, please visit http://web.randolphcollege.edu/125/.